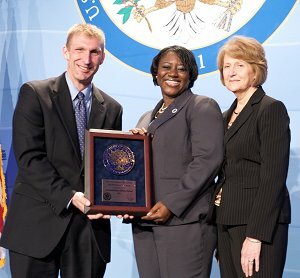 On November 14th and 15th, Mr. Paul Casarico, Principal of NPHS and Mrs. Eileen Gorman, Department Head of Language Arts were in Washington DC to attend the 2011 Blue Ribbon Awards Ceremony. New Providence was one of 14 schools from New Jersey and 300 nationwide to be recognized for this prestigious federal recognition. Honorees were given the opportunity to meet with educators from across the country to discuss best practices in education as well as attend a speech from US Department of Education Secretary Arne Duncan. To end the event, all Blue Ribbon Schools were presented with a plaque and Blue Ribbon flag. This award was the result of student achievement excellence over an extended period of time. All students, teachers, faculty and parents are to be congratulated for this honor. 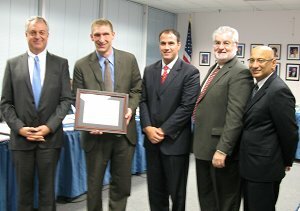 Prior to the Washington event, Dr. David Miceli and Mr. Paul Casarico were invited to a special State Board of Education meeting where NPHS was recognized for achieving Blue Ribbon status. In the picture are: Acting Commissioner of Education Christopher Cerf, Paul Casarico, Principal of NPHS, Dr. David Miceli, Superintendent of Schools, Dr. Joseph Passiment, Union County Executive Superintendent of Schools and Mr. Acelio Aponte, President of the New Jersey state board of education.